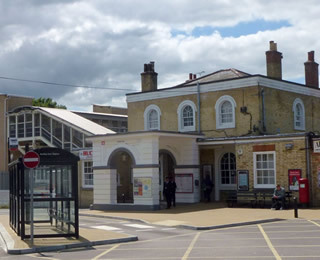 Saffron Walden has a railway station at Audley End in Wendens Ambo with trains arriving to and from London and Cambridge roughly every fifteen minutes. The Stansted Express to Stansted Airport also stops at Audley End. Audley End station is a 5 minute bus from the town centre. From Cambridge the Citi7 visits Sawston, Duxford and Saffron Walden. Saffron Walden is 50 miles from London by car via the M11 making the town easily accessible in around 1 hour. On street parking is also available in selected streets in the town centre. The London airport at Stansted, is nearby.